Welcome to the vintrace Costing guide. On this page you’ll find links to various sections of the guide.They will all open in a new window so you can have multiple pages open at the same time. If you have questions about anything in the guide or regarding costing feel free to contact our Support Desk. vintrace allows you to track wine production costs using two different costing methodologies: Activity based costing and Standard costing. Activity based costing is the default and assumes that individual costing events such as fruit arrival, additions, treatments, overheads, etc., directly effect the costing of the wines involved within those events. The Standard costing approach allows you to define a per volume standard cost based on your past experience and have this automatically updated as a wine moves through the production process. For any bulk wine or bottled stock item you can see a detailed cost breakdown as well as the history of all the cost events that have gone into that wine; e.g., blending two wines together. We have some default costing categories and you can create your own cost items that link to one of these categories for further customization. 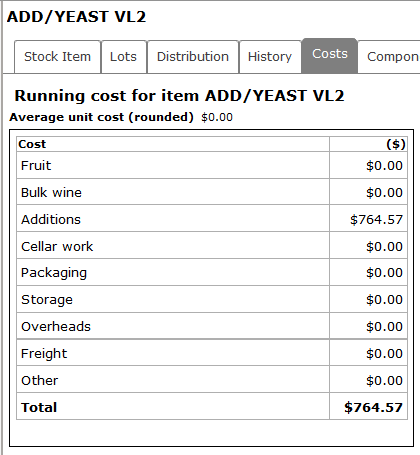 The total current cost and an average unit cost are also clearly displayed for any bulk wine or cased good. Click on the Costs tab from either the Stock Item or Product Overview to view this.